In May 2013 we, Steve & Val Hayes, went on a three week holiday in Namibia and Botswana, which we have chronicled, with photos in a series of blog posts. One purpose of the journey was to meet old friends, some of whom I had not seen for 40 years or more. I knew them when I worked for the Anglican Church in Namibia from 1969 to 1972 (when I was deported by the South West African Administration, acting under orders from the South African Security Police). We also visited some of Val’s cousins who were living in Windhoek, Namibia, and did some family history in the archives and church records. 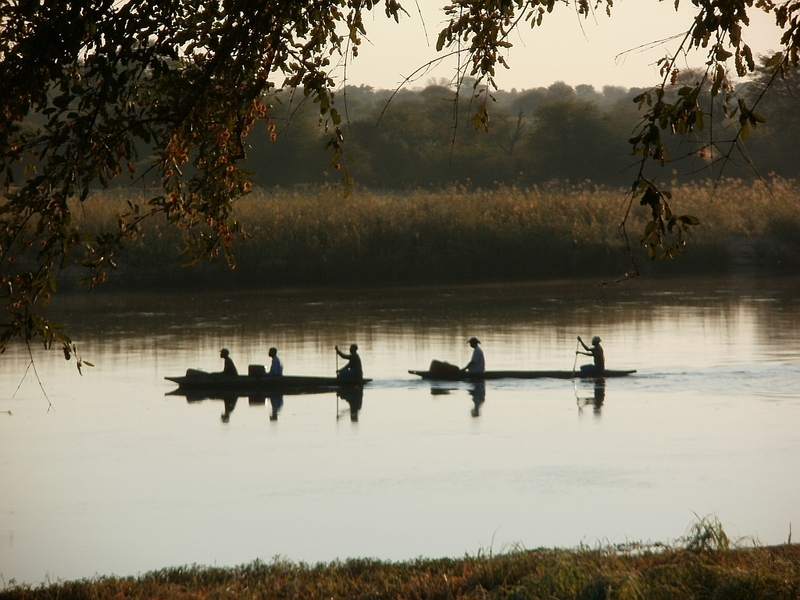 For part of our journey we followed in the footsteps of Val’s great-great-grandfather Fred Green, who in 1855 travelled up the Taokhe and Okavango Rivers by boat from Lake Ngami to the Popa rapids. One could not do that today, as you can see from some of the photos. So here are our blog posts, with photos, more or less in chronological order. Windhoek: family and old friends | Khanya. In Windhoek we stayed with Enid and Justin Ellis. Enid is Val’s cousin on her mother’s side. We also saw Bishop Assaria Kamburona of the Oruuano Church, and Kaire Mbuende, son of Gabriel Mbuende, the late secretary of the Oruuano Church, whom I knew in the 1970s. Elusive Namibian families | Hayes & Greene family history. We did some family history research in the Windhoek archives, looking mainly for descendants of Francis and Frances Stewardson (nee Morris). We found some, others remain mysterious. Books and worms and things | Notes from underground. We visited a Windhoek bookshop, which seemed to have lots of things not available in South African bookshops. And found that Enid and Justin Ellis keep some strange pets. Sunday in Windhoek: Quaker meeting and walking the dogs | Khanya. We couldn’t find an Orthodox Church in Windhoek, so we went with Enid and Justin Ellis to their Quaker meeting instead, and met another old friend, Hiskia Uanivi, whom I had known when he was a student at the Paulinum Lutheran Theological Seminary. He is now Archbishop of the Archdiocese of the Diviane Word — a title bestowed on him by the Namibian government, which said he could not register a church with the word “God” in its name. After a week in Windhoek we went North to Outjo | Notes from underground. We observed the change, or lack of it, in small Namibian towns and in the countryside, and stayed at the Sasa Safari Camp near Outjo, in tranquil surroundings with a magnificent view. In the Etosha National Park 15-17 May 2013 | Notes from underground. From Outjo we went to the Etosha National Park, where we spent a couple of days looking at wild animals. Ovamboland, Namibia 17-20 May 2013, with flashbacks to the 1970s | Khanya. In Ovamboland we met more old friends, and made some new ones. I recalled my previous clandestine visit, hidden under a matress at the back of a bakkie. This time it was open and above-board. From Shakawe to Maun via Lake Ngami | Hayes & Greene family history — Fred Green and his companions went from Lake Ngami to the Popa Falls by boat in September-October 1855. We went the other way, by car, in May 2013. A day in Maun and another boat ride, to see a spectacular sunset and moonrise over the Okavango Delta. The Botletle or Boteti River – in the 1850s Fred Green and his brother Charles were often to be found hunting on the Botletle River, so we followed the river to find what its attraction was. They also left their mark on a baobab in the area, which is known to this day as “Green’s Baobab”. Homeward bound — having seen most of what we had come away to see, we headed homewards to Pretoria. For more posts, watch this space!